A plumbing failure analysis was performed to determine why a cold water supply line to a bathroom sink had failed after only one year of service. The failed supply pipe was made of chrome plated yellow brass. Figure #1 is a photograph of the failed line. There is a large opening which was the primary crack; in addition, there was another small crack near the ferrule. It is believed that this 'second' crack opened up when the corrugated tube was removed from service. 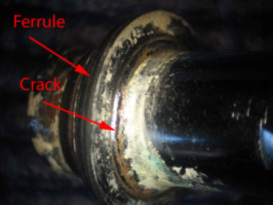 This pipe failure analysis focuses on the initial plumbing failure (i.e. the primary crack). Figure #1: Photograph of the failed cold water supply line which is the focus of the plumbing failure analysis. It is a corrugated line made from chrome plated yellow brass (65% Cu/ 35% Zn). The pipe failure analysis was performed by visual and with a microscopic analysis. In addition, the pipe failure was cross-sectioned and again viewed with a microscope. The figures below summarize the physical findings of the failure analysis. Figure #2: Photomicrographs of the primary crack. It appears to have formed at a "kink" in the tubing created during installation. In addition, the fracture surface shows areas of Zn depletion. It appears that the tube had been straightened during or after removal. There is a continuation of the primary crack shown in the upper right photomicrograph. 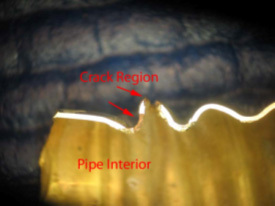 This crack extension shows how brittle the pipe is in the region of the primary crack. 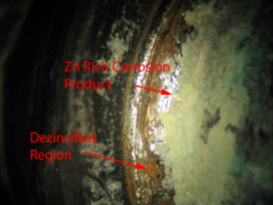 Note also the white Zn rich corrosion deposits associated with the corrosion failure. Figure #3: Photomicrographs of the failed pipe after cross-sectioning. The cross-sectioning exposes the crack region. Associated with the cracking is a change in color of the brass. 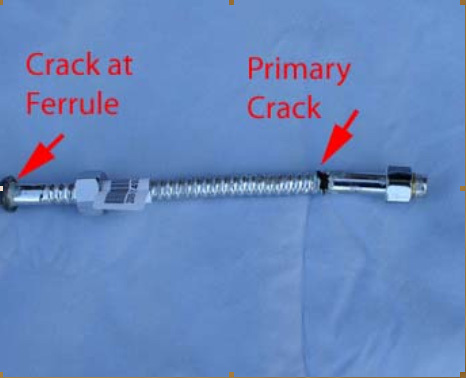 There are Zn depleted regions, and this indicates localized brass dezincification associated with the cracking. The higher magnification photo on the right shows a distinct color change of the brass. 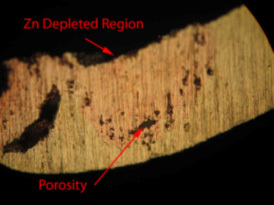 In addition, there is also porosity associated with the Zn depletion of the brass near the failure. 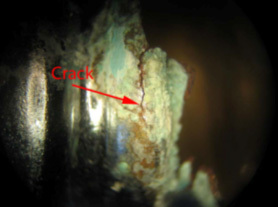 Figure #4: Photomicrographs of another crack located where the ferrule is deforming the tube at one end. This crack also has brass dezincification associated with it. The cracking appears to be the result of stress corrosion cracking. There is residual stress as a result of plastic deformation of the corrugated yellow brass tubing during installation. The metal corrosion also appears to be associated with the absence of the chrome plating. In addition, there is brass dezincification as a result of the stress corrosion cracking. Possibly, ammonia containing cleaners had been used on or near this supply line, and this contributed to the corrosion. 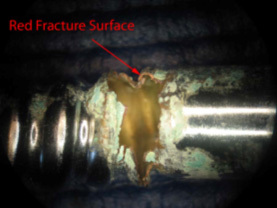 The plumbing failure analysis indicates that the failure was a result of stress corrosion cracking and dezincification of yellow brass. This failure is appears to be localized season cracking of brass. Dr. Thomas L. Read, CEO of Read Consulting received his PhD. from Stanford University in 1972. He has over 25 years of manufacturing experience in electronics, metallurgy, factory safety, failure analysis, glass fracture, glass failure and bottle failure. As a member of the electronics industry, Dr. Read has earned process patents and has an extensive background in manufacturing techniques. 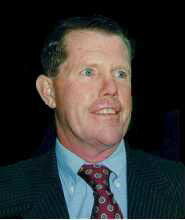 In parallel, he has spent over twenty five years as a consultant to attorneys and engineers in the areas of failure analysis, metallurgy, glass fracture, glass failure, bottle failure, factory safety, manufacturing problems, intellectual property and patent disputes.